Three Avengers’ lives depend on Manifold breaching the unbreachable. What is Manifold’s true destiny? Art- Stefano Caselli’s art was on pint, gorgeous and kissed ever so gently by Andres Mossa’s colors you would think the two were married. Love the art! Black Hero– Eden Fesi/Manifold, protégé of the late X-man Gateway and one of only a handful of Australian heroes of aborigine descent is present and accounted for. Hickman did a bang up job on him during both Secret Warriors and later Avengers (2013). Seeing him on the cover and back in action is a real treat. Captain Universe is still knocking around the Avengers part of the galaxy which is also good since whatever grand plan Hickman has for the Avengers must involve the manifestation of the universe’s consciousness in some way. Story- With Sunspot and Cannonball captured and Smash brainwashed by AIM captain America has to find a way to rescue his team. Iron Man tries to recruit Manifold who quickly turns him down since his powers have been behaving wonky. As Iron Man leaves he meditates and has a vision about Captain Universe. At the end of the vision his powers are restored and he teleports to Cap and crew ready to aid the cause. Continuity– I loved that Manifold was affected by the events of Infinity. I love that this was mentioned and brought in as a story point. Too often marvel has events which have no ramifications of are simply forgotten in later years, or months. Accessibility– Considering the only Avengers books I’ve stayed with after Infinity is New Avengers (2013) and Mighty Avengers (2014) I found this issue quite accessible despite being away for quite a few months. As a result this issue is a good jumping on point for those who left during Infinity or perhaps are just getting into comics. 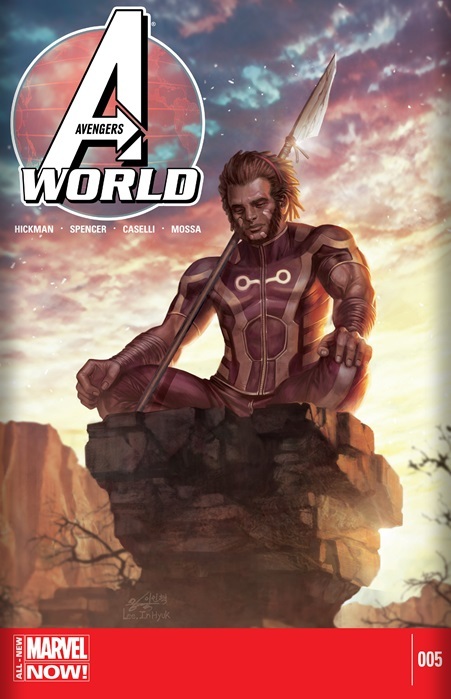 Cover– Our hero Manifold sitting in his meditation pose, spear on his shoulder bathed in sun-setting light, this is a gorgeous image. I didn’t understand Eden’s confusion over Captain Universe’s reference to Dreamtime?? If he’s aboriginal, why would he not understand the concept of a sentient universe ‘dreaming’?? That is a good question. But I think this is the first time that Manifold seen the dreamtime. Ever since his inception, we never seen him interact or even see the dreamtime. Also I wonder if the dreamtime is like the dreamspace as seen in avengers 7-8 of hickman’s run.